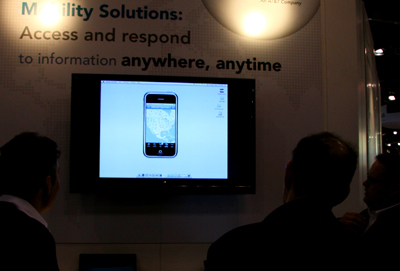 I spent a couple of days at the annual National Retailer Federation (NRF) show this past week. The focus of the show was on Demand Driven Retailing as outlined by AMR in the 6th annual Sunrise Breakfast. Bottom line, Wall Street cares about inventory turns. And how are winning ‘demand-driven' retailers, like Urban Outfitters, Best Buy, Chico's, CVS, REI, and Sainsbury, getting 30% better inventory turns then the rest of the industry? They are executing well on five collaborative data management and demand intelligence strategies. They are: 1. Orchestrate Cross-Channel Operations 2. Become Shopper Driven 3. Build Value Networks 4. Drive Innovation into products and services 5. Deliver Consumer-centric retailing. Most of you reading this blog are familiar with a product or services of Sterling Commerce. I got to know Sterling Commerce intimately starting in the EDI space in the mid-90's when I competed directly with them at Premenos for software. Since then I have experienced varying love-hate relationships with Sterling while at partner and competing organizations. 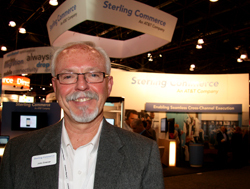 But this week I was re-introduced to Sterling by a retail technology expert and 26 year Sterling employee, John Stelzer, whose title is Director of Retail Industry Marketing. What surprised me the most was the depth and breath of Sterling's supply chain solutions whose reach extends to the hands of end consumers in an iPhone retail application. With 80% of Fortune 500 companies using software or service from Sterling, many of us know their EDI/XML any-to-any file translation software products and VAN services. Some of you might have had experience with their manage file transfer products, Connect:Direct, or have used their enterprise application integration tools. But today, Sterling Commerce uses its fungible proprietary translation knowledge to extend solutions to retailers that include ecommerce cross channel fulfillment, order management, mobile commerce, and supply chain visibility intelligence. GTBP: John, educate me on these offerings with a few examples of how they are being deployed today. Starting with the consumer, our new mobile store application allows our retail clients to configure a mobile presence and shopping catalog for consumers to shop on their iPhone. The retailer would use Sterling Commerce software to configure the application with information and items. The mobile app utilizes Sterling Enterprise back end supply chain applications of inventory and order management to deliver robust support of actual inventory information that is of real value to the consumer. For instance, if you click on the Lowes icon on your iPhone, you can search for an item that is within a twenty mile radius or choose to have it shipped right to your door. Another version of this software enables an in-store associate to better assist customers with access to global inventory visibility. If the product is not on the shelf, the associate could find the next closest location for pickup or complete the order and have the product shipped to the customer. Beyond order capture from kiosks, web, store and customer service agents, Sterling's cross channel order management system guides clients along the efficient frontier of operational optimization to maximize value for consumers. Most retailers' legacy systems have separate silos for order fulfillment. Our configurable solution, which can interface with current legacy systems, can find the most efficient source for order fulfillment. Those sources might be a store, a DC, web store inventory, or a drop-ship vendor. If there were multiple items on the order, our system can break it down to the SKU level and source it from multiple locations. The retailer can utilize logic that might also offer free shipping on certain smaller size, higher margin items. The Supply Chain Visibility tool sits over the entire fulfillment cycle from inquiry to cash and return. There are other similar visibility solutions on the market today. But where the Sterling visibility tool is unique is how it operates on a higher business operational level. While other solutions focus on the transactional EDI data and syntactical errors for vendor EDI compliance, we do that too, we address the management of the data at a higher level. Warehouse, Store Manager, Logistics, and Merchandiser, all have different questions on the same data. We provide business process dashboards with the ability to drill down into the data that offers structure to rectify supply chain disruptions like late shipments, short shipments, incorrect items, and discrepancies from data to delivery. One of our clients wanted visibility into the time between unloading a truck and the items being entered into the inventory management system. They discovered an enormous process gap. They were sitting on inventory and could not do anything with it. The report gave visibility to this issue and allowed the company to set new milestones in closing the gap. Be careful what you wish for. If it's visibility that you want, the visibility gained might not be a rosy as you thought. GTBP: What are your thoughts on the GXS-Inovis merger? How will this affect Sterling Commerce? What is Sterling's competitive advantage? At Sterling, we don't expect to see any real change in the marketplace with the combination of GXS & Inovis. We only run into them on the integration side. As a company Sterling Commerce is more diversified and our bread and butter does not rest solely on integration. We compete with many different companies in separate parts of our entire suite. There is not one other company that offers the full suite of solutions, from application management to supply chain integration, that Sterling Commerce offers today. We have an advantage over IBM, Microsoft, Island Pacific application because of our deep supply chain integration back end. We have an advantage over GXS and Inovis because of our application features on the front end. Our solutions just don't help retailers trim costs out of their processes. They do that, but they also create competitive differentiating experiences for the consumer and that is where we get really excited. Many of the winning demand-driven retailers here at the NRF conference today, like Best Buy, Urban Outfitters, Cabela's and DSW, are Sterling Commerce clients. GTBP: Thank you for your time John, Joe. I look forward to visiting with you again. It is interesting to see the evolution of Sterling Commerce from the early 1980's of moving companies off paper purchase orders to today's mobile access to collaborative data. And over these thirty years, Sterling Commerce has not only survived and adapted to dramatic changes of the global economy and technology, they continue to lead.